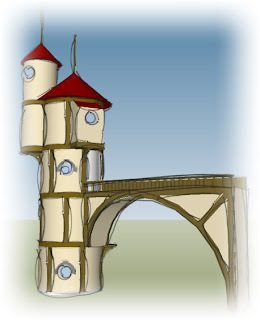 I got the test laser cut kit for the Tew-Fah bridge and the Pryn-Gul tower yesterday. 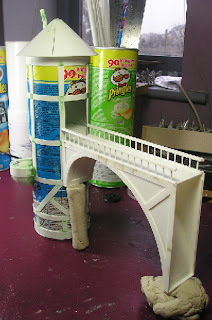 This is the first assembly of the bridge alongside an early example of the Pryn-gul tower. That's really nice! Would the bigger side be available so you could build a bridge with equal sides? I can see this making a great piece of terrain for other games than twilight! Wonderful! Hi Weird Chris, thanks for the compliments. I deliberately wanted to make something quirkier than the norm so hit on this asymmetric design. The 'kit' makes the bridge as shown, although it would be possible with 2 kits and some minor conversion work to make a large bridge and a small one. The railings wuld be the most awkward bit. I hadn't thought of that before. Thanks for the idea. 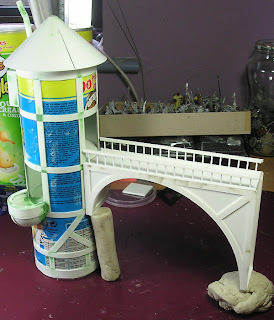 I have plans later this year to build a modular terrain board for Warhammer and that bridge would look spectacular over the river. Very nice work indeed Alan. Keep it up.